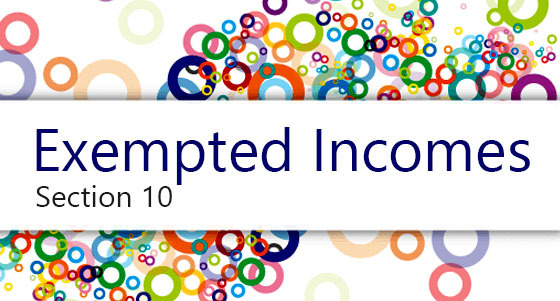 ‘Nil’ return may be filed by you for a particular tax period, if you have not made any outward supply (commonly known as sale) and have NOT received any inward supply (commonly known as purchase) of any goods/ services and do not have any tax liability for that particular tax period. In the GSTR-3B tile, click the PREPARE ONLINE button. 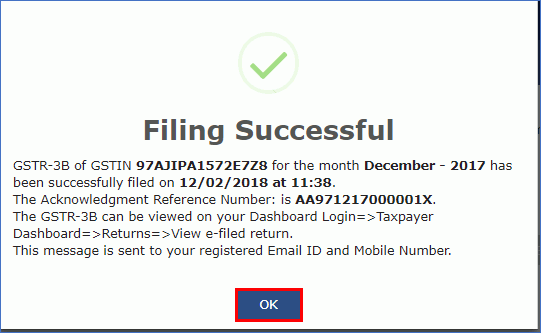 Note: The due date for filing GSTR-3B is displayed on this page. 7. A list of questions is displayed. You need to answer the questions to show the relevant sections applicable to you. 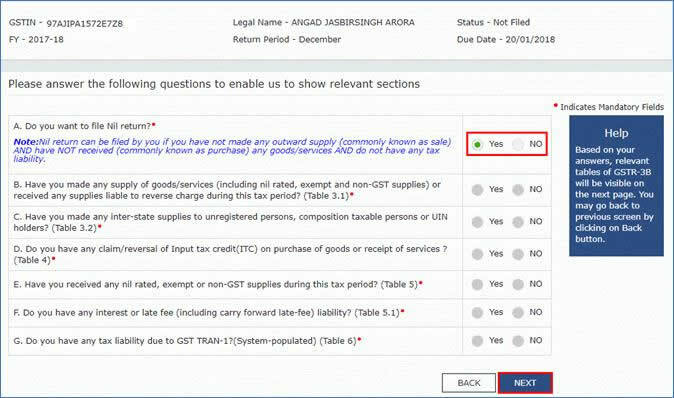 Select Yes for option A 'Do you want to file Nil return?'. Note: All other options will get disabled once you select 'Yes' in question A. 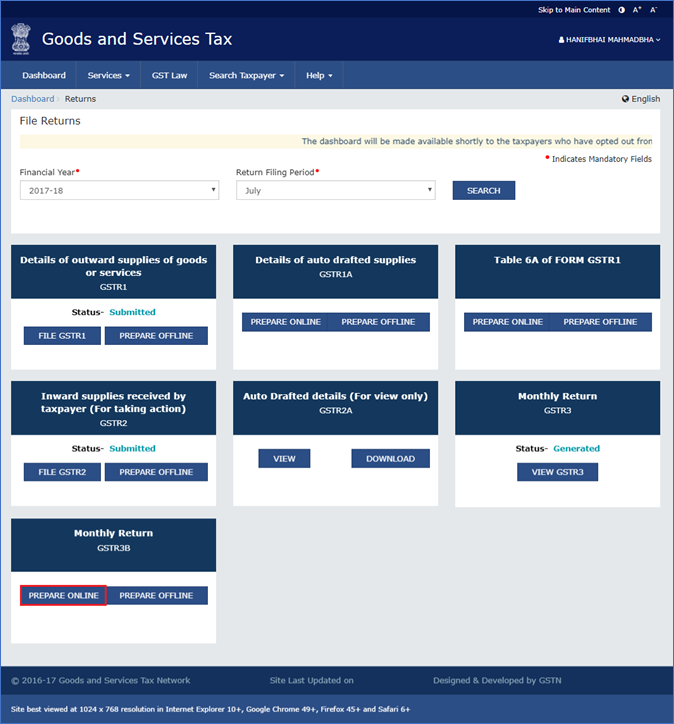 The GSTR-3B – Filing of Tax page is displayed. 1. Click the PREVIEW DRAFT GSTR-3B button to view the summary page of GSTR-3B for your review. 2. This button will download the draft Summary page of your GSTR-3B for your review. All entries will be zeroes. Since, no payment is involved, therefore, table 6.1 will not be there. The PDF file generated would bear watermark of ‘draft’ as the details are yet to be filed. 1. Select the checkbox for declaration. 2. From the Authorised Signatory drop-down list, select the authorized signatory. 3. 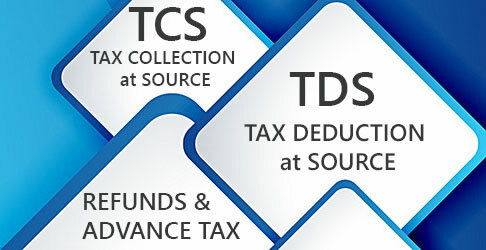 Click the FILE GSTR-3B WITH DSC or FILE GSTR-3B WITH EVC button. 4. Click the PROCEED button. 5. The success message is displayed. Click the OK button. The status of GSTR-3B is changed to Filed. 1. 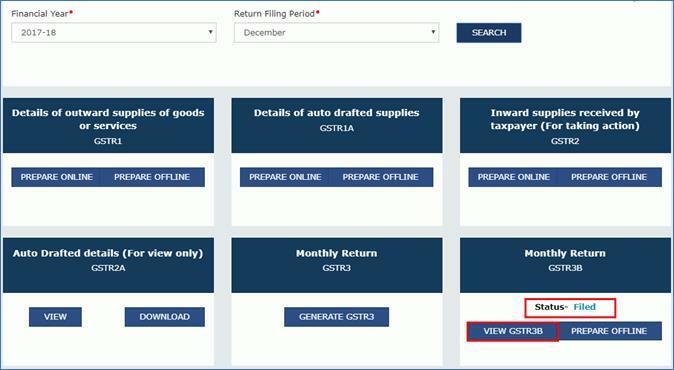 Click the DOWNLOAD FILED GSTR-3B button to download the filed return. 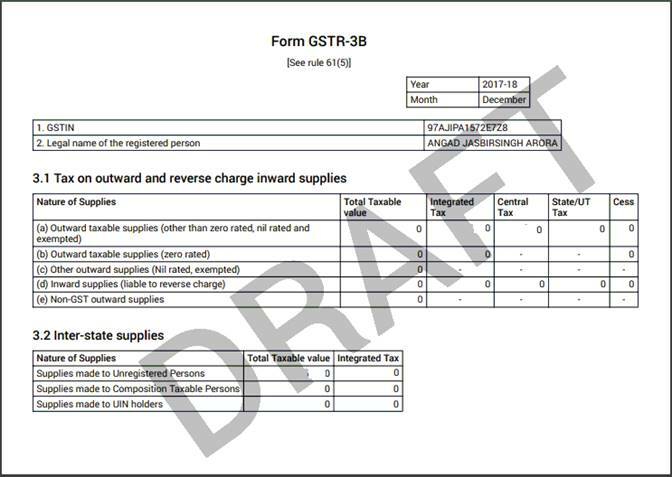 The PDF file generated would now bear watermark of final Form GSTR-6. 2. Click the Back button. 3. The File Returns page is displayed. Select the Financial Year & Return Filing Period (Month) for which you want to view the return from the drop-down list. Status of the GSTR-3B return changes to "Filed". You can click the VIEW GSTR3B button to view the GSTR-3B return.